Where Are You Birding This Fourth Weekend of April 2011? I don’t know about you, but I’ve been barraged by some of those April Showers the poets love to dwell on. I’m also buried by a bunch of birthdays. Birds, on the other hand, are just beginning to build up in numbers. Spring migration has most likely manifested in some form or another everywhere on the planet. The fun this time of year comes in parsing out the phenological signs! What will you be doing this weekend and will you be birding? Share your plans in the comments below! My busy weekend may preclude me from doing more than admiring the new visitors to my feeders; perhaps I’ll find the time to figure out how many lifers and new ABA birds added on my recent Texas trip! Corey plans on visiting his folks up in the Saugerties area rather than chronicle minute seasonal shifts in Queens avifauna… what is wrong with him? 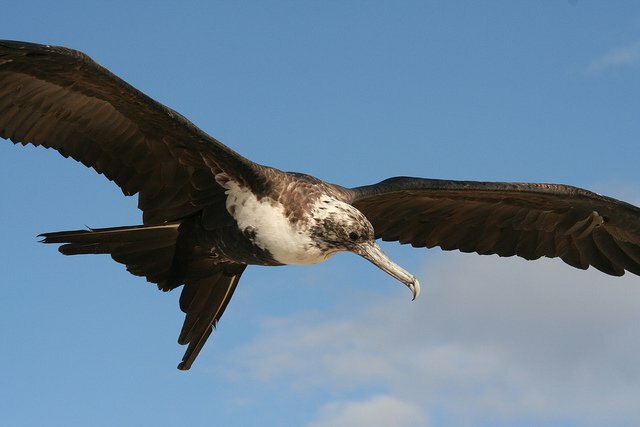 Keep your eyes to the skies for awesome seabirds like this Great Frigatebird by Duncan Wright! What a great capture! I didn’t see any of these while birding at Salton Sea, of course, but I was amazed at the variety of birds I did see. I’m off to the Waiarapa and Hawkes Bay this weekend. Mostly wine-tasting, but I may convince my fellow inebriates to swing by Mt Bruce Bird for the bird centre there. Look at the beak on that fellow! Very nicely captured. Awesome bird n shot! Happy Easter to you n yours! Can you send me the rain?